The sharp 10% correction in stocks earlier in the year seems like a distant memory. Domestic equity markets regained new highs in the third quarter as the ongoing narratives surrounding shaky emerging markets, never-ending Brexit negotiations, rising interest rates, and trade tensions failed to dent confidence. It’s enough to keep cautious investors questioning if we are closer to the end of this decade-long bull run. Despite these headwinds, confidence in the economy continues as job growth and economic activity move along. Corporate earnings continue to exceed already lofty expectations, helping support equity valuations. Global stocks pushed higher in the third quarter. 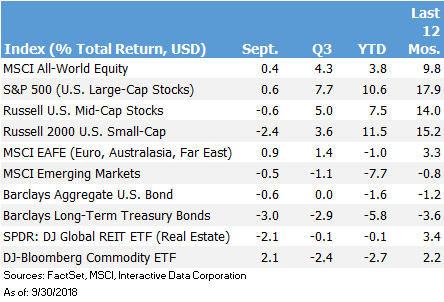 Stabilization of the US Dollar and reduced uncertainty on the trade front helped global stocks add 4.3% in Q3. The bond market continues to feel the drag of higher interest rates, hampering near-term price performance. The steady flattening of the yield curve has stalled for longer-dated maturities – a potential sign bond vigilantes are crying uncle to the Fed. International markets are a drag on global stock markets this year. But we are reminded that effective diversification often means that, at any given time, there will be a part of your portfolio you will likely despise. Investors still benefit from an internationally diversified strategy. While international stocks will suffer from the same ups and downs as shares in US-based companies, broad global exposure protects long-term stock investors from long, drawn-out bear markets that are primarily driven by a country’s economic performance. Additionally, while a US domestic investor gains some international exposure through US-based multinational companies, this investor still misses out on significant economic and market forces that could generate return for shareholders. Many international firms also sell into the US. A purely domestic investor misses some import-led domestic growth opportunities as well as certain global market opportunities. Valuations for many international stocks are also more attractive, suggesting investor sentiment is currently down on these sectors of the market. Over time sentiment ebbs and flows, benefitting those patient enough to ride out the lows. Market strategists spin stories about why US stocks have outperformed this year, but this is little help as a guide for what may come. A broad, well-diversified strategy provides discipline and the stability to stick to long-term goals. It’s not easy to identify financial scams. Scam peddlers are often well-rehearsed, sometimes with polished primetime television commercials, as in the recent case of a Knoxville-based financial salesperson promoting high-yielding, investment notes with 10% returns and an average term of nine months. Fraud is a cancer on the investment industry, preying on the greedy, the overly-trusting, or the ill-informed. The saying goes, if it sounds too good to be true, it probably is. The tricky part is identifying what sounds too good. We think it’s helpful to always be on the lookout for the warning signs of potential fraud. Always invert. Just as you want to earn the best return on your money, a business owner wants to finance his or her operations at the lowest possible cost. That typically means seeking funds from friends and family, banks and other professional investors specializing in private investments before turning to individual investors. It’s always helpful to ask: who has passed up this opportunity? Are there good reasons for seeking funds outside traditional banking and private financing channels? Occasionally there may be, and it’s worth understanding why. Guarantees are a bad sign. All investments have the potential to lose money. A fundamental law of investing is return is the reward for taking risk. If there is no risk, then the returns shouldn’t be much more than what your money can earn in a bank. In the financial world, nothing is risk-free. In fact, the mere mention of a “guarantee” is a likely warning sign. Have a good baseline. A good perspective on financial markets – both the historical record and reasonable expectations for broad asset classes – can also help raise red flags. Investments with similar types of risk should yield a similar return. It’s reasonable to expect that two AA- rated corporate bonds maturing in five years should have about the same return. Of course, actual returns can be very different if one company reports good results and the other languishes. But the promise of unusually high returns at the outset compared to other comparable investments is a sign to tread cautiously. Someone claiming a 10% return on nine-month loan is “safe” in the current low interest rate environment should set off a host of alarms. What’s in it for you? Too many representatives in the financial services industry are heavily compensated to sell products or place deals. It’s always worth asking how the advice-giver is compensated, allowing you to identify potential conflicts of interest. If the sales incentives seem too high, that is yet another reason to worry. If you are wondering, $1 million in four months is. Asking the right questions can help spot the red flags. Get-rich-quick and Ponzi schemes are as old as civilization and despite regulators best efforts, fraudulent investment opportunities will continue to seek victims hoping to make out before anyone catches on. The fourth quarter is shaping up for more drama. A heated midterm election will be heavily in focus as Republicans fight to control Congress. Italy’s deficit-expanding budget proposal threatens another showdown with their northern European counterparts. A sigh of relief was felt in markets as trade negotiators reached an agreement to modify NAFTA, avoiding a complete fallout as some feared. But a deal seems far from certain with China as divisions runs much deeper. Still, markets have a long and deep history of working through these uncertainties. Always remain vigilant. A healthy dose of skepticism is a valuable asset when considering new investment pitches. That goes for legitimate and illegitimate strategies alike. Of course, working with trusted advisors can also help evaluate any potential opportunities.